Meet our beautiful senior girl, Sofia. She was found as a stray, although the shelter believes her owner was the one who turned her in. Her condition was appalling -- her coat was matted tightly and painfully to her skin as well as being urine soaked. She was stained from head to toe, her eyes weeping and she was bone thin. The shelter was kind enough to reach out to us to get Sofia immediate help. 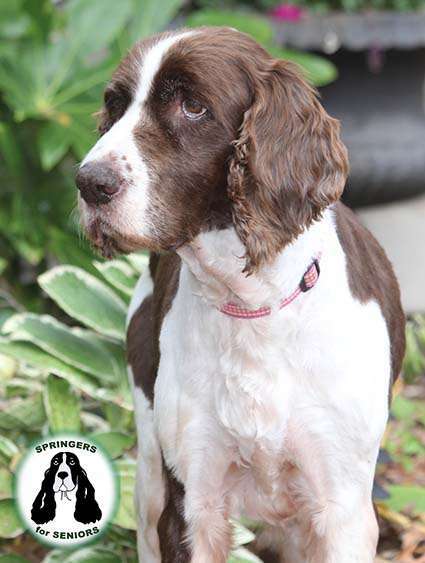 When she arrived, we found the sweetest, most timid Springer who clearly had a rough life. Neglect was apparent, but we started seeing some signs of abuse as well. We believe she lived in a very small space, perhaps a cage or crate. Slowly, she has come out of her shell and all that beauty inside is starting to shine. She still does tuck her head on occasion when you reach out to pet her. She tested positive for heartworms, yet her lungs looked fine and heart sounded strong. Given her age, we opted not to treat her but, instead, give her a monthly dose of Ivermectin. She was sedated to have a couple of growths removed and give her a much-needed dental. Sofia was also incontinent when she arrived. We finally have that managed with a couple of different meds. She also suffered from allergies, but is under control completely with a pill each day. She has gained a few pounds along with muscle mass. She is a whole new girl: running around and occasionally jumping up on you with excitement. Hew new family will need to continue with a high-quality diet, daily fish oils, Apoquel for allergies along with her incontinence meds. Sofia is the easiest girl to care for. She absolutely wants to be with you all the time, she loves to snuggle and she loves her toys. She would very much enjoy daily strolls and car rides as often as possible! She is always raring to go anywhere in the car with you! Sofia fares well with other dogs and really enjoys them, but she can get jealous on occasion about sharing the love. We think she would prefer to be an only dog in the home, but could share a home with just the right dog. She is a very gentle soul and would be good with older children. Our seniors need us the most -- their love is eternal. Please email her foster family if you would like Sofia to be "your girl." Please submit an Online Adoption Application if you are interested in Sofia. It is always the first step in our adoption process.